If anyone knows Transcendental Meditation, it’s Bob Roth. One of the most sought-after meditation teachers in the United States, he has taught thousands of people how to meditate over the last 40+ years. Strength in Stillness: The Power of Transcendental Meditation is his latest effort to explain what Transcendental Meditation is and what to expect if you decide to learn it. To be clear, this book does not teach Transcendental Meditation. Roth argues that this form of meditation can only be taught face to face. Strength in Stillness is instead a highly refined sales pitch for Transcendental Meditation. The cost to learn Transcendental Meditation in the reviewer’s area is $960. Across the border in Vancouver, Canada, the cost is over $1300 (Canadian). It should be noted that 100% of the proceeds from the book go to scholarships for at-risk populations to learn Transcendental Meditation. If you know that before choosing to purchase or read the book, you can go in with a more accepting heart. Meditation of all types is a practice that takes one into his/her inner self. It is a mental exercise that can calm the psyche and on occasion, leads one to heightened states of spiritual awareness. It is an action that works to quiet the mind. These different techniques are divided by Roth into three overarching systems: “Focused-Attention,” “Open-Monitoring,” and “Automatic Self-Transcending.” Of these techniques, Roth argues that Automatic Self-Transcending is the most effective and easiest to learn. It moves one almost immediately into a state of “restful alertness.” Transcendental Meditation is a form of Automatic Self-Transcending. Its purpose is to give one access to the “unbounded field” of deep inner-calm and consciousness that exists within us but is difficult for most of us to tap into. What the book does exceptionally well is lay out exactly how one will benefit from Transcendental Meditation and what to expect in the four learning sessions one can purchase to learn the practice. In Strength in Stillness, Roth details what happens in each of these days, from the private session in which one is given a mantra to follow-up sessions. Strength in Stillness is also full of first-hand accounts of individuals who have used Transcendental Meditation, some of them celebrities or individuals in high-profile positions. These can seem a bit too much and reek of name-dropping. However, there is one story of a regular individual who has learned Transcendental Meditation; it was much more appealing and gave a more balanced view of how an average person might respond to the technique. The main benefit of Transcendental Meditation, and indeed all forms of meditation, for trauma and addiction treatment is that it accesses a part of the brain that brings calm without stimulating the trauma itself. Anyone who suffers from these disorders or knows someone who does should consider a regular meditation practice as an adjunct to other forms of treatment, particularly psychotherapy. Meditation can support and improve outcomes for many forms of mental illness treatment. 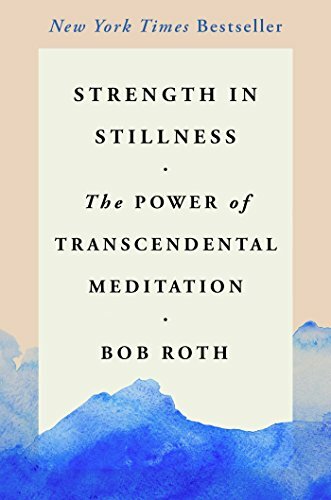 While Strength in Stillness: The Power of Transcendental Meditation by Bob Roth is a well-written argument for the value of Transcendental Meditation, it seems inappropriate and disingenuous to offer this book without sharing how the meditation practice is done. The stories about celebrities and their practices don’t correlate with the day-to-day lives of regular practitioners and the cost to learn the practice feels out of line. If Roth and his cohorts have something that meets the hype in his book, they should be giving it away to those who most need it. A true spiritual practice is not a propriety product for sale.